Battery Combining is the industry accepted “Best Method” for split charging batteries. Combiners work in the same way as a VSR. However, Connect Voltage and Disconnect Voltage are configurable. This allows you to ensure that engine batteries are charged properly before connecting auxiliaries. 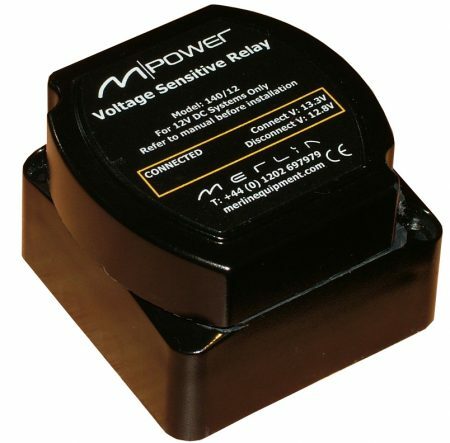 A Timed Hold delay feature prevents rapid cycling of the Split Charge Contactor on systems where very large battery banks are fitted, large loads are present or where charge sources are undersized. All Merlin SmartBank Combiners feature an Emergency Parallel switch. When activated, this allows ‘Jump Start’ of the engine if the engine battery fails; Or, to allow auxiliary loads (e.g. internal lights or communications kit) to be run from the engine battery for a limited period of time. Emergency Parallel saves expensive Recovery call outs. In many Emergency Service Vehicles, adjustable split charging is crucial to vehicle reliability. Due to short journey times, quick connection of split charging is necessary (without compromising chassis electrics) otherwise no power reaches the Auxiliary batteries. Non-adjustable split chargers do not allow this. SmartBank is a perfect solution to the problem. Battery Combiners are ideal for all applications. Multiple combiners and different combinations of Split Charge Contactors can be used to achieve complex and advanced systems. Careful placement of contactors can also determine the order in which batteries charge/discharge and prioritise them accordingly. for specialist advice for your own split charging application. 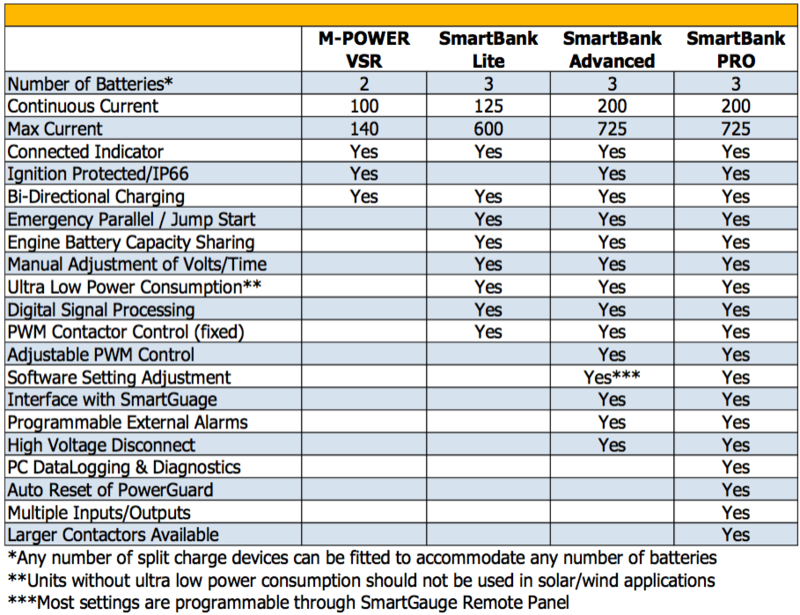 SmartBank Lite – CE Marked, non-type approved for use on off-road applications like boats, solar installations and where only a limited degree of controllability is required. SmartBank PRO – E-Marked and CE marked for use on vehicles requiring type-approved product. Fully configurable using manual trim-pots or via computer interface. Digital Datalogging. 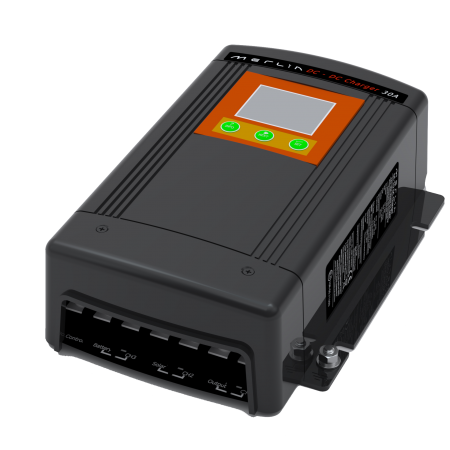 Smart Internal Algorithms allow SmartBank PRO to be used on some vehicles that employ SRCS (Smart Regenerative Charging System) alternators and brakes. Can be used for up to 3 separate battery banks. SmartBank Advanced – CE Marked, non-type approved. 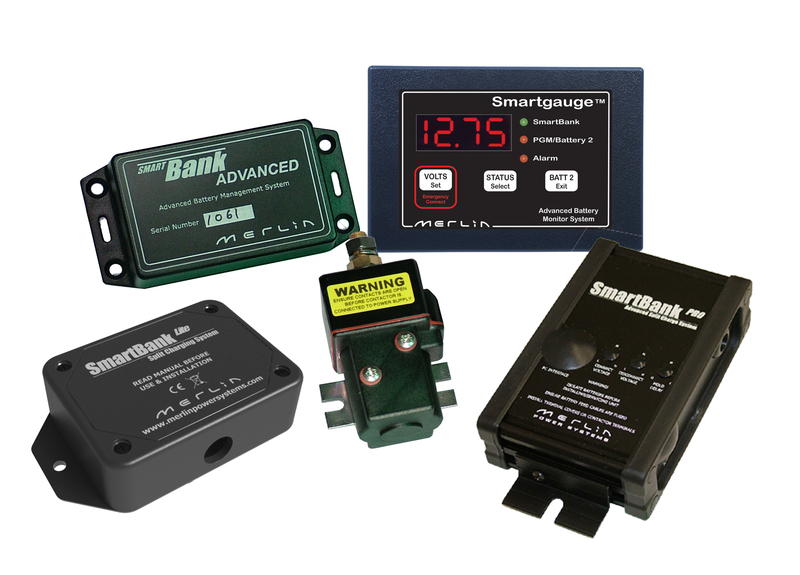 SmartBank Advanced combines our SmartGauge Battery Monitor with SmartBank to provide an integrated system. Ideal for medium to large size boats.